Long standing knee pain can cause secondary problems in the back, foot or posture. Fixing knee pain as early as possible gets your whole body healthy. 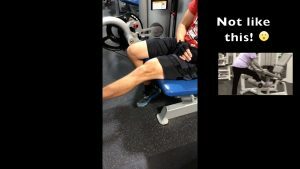 This exercise will improve the common part of the knee to cause pain: the inside. This is where the VMO (vastus medialis obliquis) muscle attaches. With consistent walking or exercising, the outside of the upper leg muscle (T.F.L.) tightens causing an an imbalance at the knee. 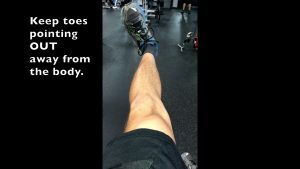 The tightness of the TFL muscle weakens the inside VMO causing the knee pain. This exercise helps return the balance by strengthening the inside knee. Position yourself on the edge of a table or bench where your legs will hang. or at the gym, on this machine. Extend your leg out to lockout the knee with your foot turned OUT. hold for a second, then return to the starting position. Repeat 5-10 times as recommended by your chiropractor. This simple exercise will relieve your knee pain, build strength and improve your posture. We all want to avoid falling, unless your a stunt double. In this talk I give these active seniors my best exercise and ideas how to improve and keep their balance. Anyone who have suffered a lower body injury or had surgery can use this to simple get themselves well. Also, I give you the links to the specific exercises to see the details when practicing at home. Enjoy. Improving your ankles to help balance (15:00). How to avoid atrophy/muscle weakness (18:55). Vision is important for balance (28:40). Dr. Tony’s wrap up (36:10). Keeping and recovering your balance can be a challenge. And when you do these exercise routinely, you will avoid falls and injuries that can affect you and your family permanently. Then adding more exercises feels good for the body and mind. #1 cause for chronic low back pain today is sitting. Sitting allows the body to naturally hunch forward. This occurs in a car, at home or work. Robert’s job requires flying around the country 3-5 days a week. From Los Angeles to New York then back is a long day. That sitting and limited exercise changed his posture and weakened his back. Then the soreness turned into leg pain. This was a concern because NOW he could not work. At this point taking x-rays helped Robert understand his pain was coming from a spinal condition. Then treatment was able to help fix his back to stop the pain. Now Robert is back to work and cheering on the Jaguar’s, his daughter’s team. ?Understand how Chiropractic can help you.? All of us want to feel and look good ALL the time. Being human, it takes work. Living the day-to-day dog-eat-dog work can make it difficult (not impossible) to do this. Short term we may not see any differences in our health. Long term the body adapts to the stressors around us by causing our body and mind to stay in a stress state. Examples of this are less recharging sleep, muscle/joint pain, abdominal pain, headaches, anxiety, grouchiness- you get the idea. Then our body wants to stay in it’s new “normal” state by eating sugary foods and not exercising. It takes work (physical activity and keeping a positive attitude) to stay healthy. DO THE WORK! It won’t be easy or fun sometimes. But we will look and feel good? Spinal Arthritis (osteoarthritis) is a condition of the spine causing pain and neuropathy. This condition is common is seniors and can occur in younger adults due to trauma or secondary to Rheumatoid Arthritis or Ankylosing Spondylitis. This article will explain the abnormal changes that occur in the spine, the symptoms a patient would feel, the diagnostic imaging, blood work, and the specific treatments offered for spinal arthritis. Ligaments in the body connect bone to bone. When these joints stay loose, the ligaments around the spine maintain their elasticity. This allows calcium not to be deposited in the ligaments, keeping the spine and disc healthy. Spinal osteoarthritis occurs when the front, anterior longitudinal ligament of the spine becomes rigid, and then calcifies according to Arthritis.org. This limits motion in the spinal joints. If untreated the spine can degenerate causing disc and nerve conditions. Do you have spinal arthritis? 1. Back/shoulder stiffness early in the morning that lessens throughout the day. The lack of motion when sleeping increases pressure, then pain. 2. The pain intensity can worsen in the evening. The joint pressure has built up throughout the day to cause this. 3. Sleeping can have increase in intensity of pain. A lack of motion increases pressure then pain. 4. Pain can intensify with climate cooling/barometric pressure change. Scar tissue in the joints allow pressure to build up. 5. Pain can cause achy/stiff joint and pressure. From a lack of motion, the joints build up pressure to cause this. 6. A crunchy or sandy joints with movement. From Arthritis-health this crepitus is the air bubbles popping in the joint that lead to degenerating the joints. 7. If there is irritation of the nerves, neuropathy can occur down the arms or legs. This can feel like pain, numbness, weakness, tingling. Imaging. An X-ray is the first testing that can verify the stage of degeneration and/or osteoarthritis. Arthritis-Health explains this would show calcification in the ligaments between the spinal joints in the front or back of the vertebrae. The level of calcification can be considered bone spurs and osteophytes. Because of the high concentration of nerves radiating from the spine, even minor cartilage damage or bone spurs can translate into a lot of pain if either is in a sensitive spot. Therefore, the X-ray is just one tool to be used in conjunction with the patient interview and physical exam can be positive indications of osteoarthritis. Other secondary imaging findings can be degenerative disc disease, spondylosis and osteopenia. An MRI or CAT scan can provide detailed soft tissue or bone structure imaging unviewable with an x-ray. This type of imaging can give you cross-sectional views details seen on 3D or 4D. Diagnostic injections can pinpoint the source of pain to a specific joint. Using a local anesthetic can test the patient’s level, if any, of pain relief. Labs/blood work can rule out systemic inflammatory diseases such as Rheumatoid Arthritis (RA), spinal infection, cancer according to WebMD. If testing for spinal arthritis is negative for permanent neuropathy. Then conservative, non-surgical treatment can help recovery and return a better quality of life. 1. Lessened physical activity with alternating heat and cold treatments. Lowering a person’s physical stress can help reduce the inflammation and help joints move with less pain. 2. Stretching joints and ligaments to break up any scar tissue in the joints. Starting on your own, a person can learn active stretching at home. Routinely stretch like these from Arthritis Health can help start the process of forming good habits to limit flare-ups. 3. A physical therapist can help guide you in specific stretches, correct walking, bracing, taping, manual therapies and machine therapies to reduce the symptoms of spinal arthritis and help build flexibility/strength according to Move PT. 4. 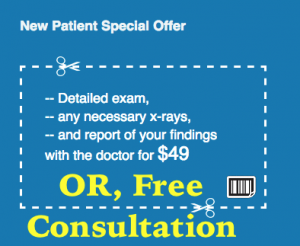 A chiropractor can help diagnose severity of the condition through x-ray analysis and examination findings. Then moving spinal joints using specific chiropractic adjustments can help break up scar tissue in the joints to improve motion, reduce pressure then pain in the spinal joints according to Discover Chiropractic. These treatments will be effective to return motion in the spinal joints. This will cause the back/nerve pain to be removed, and strength return. Keeping the spinal motion normal beyond feeling pain allows the spinal discs to have better circulation. This will allow the spinal joints to regenerate and heal. This may take 2-4 months depending initial symptoms. An x-ray can verify the results. My monthly talk explains how chiropractic care works. This talk gives patients the knowledge to understand how your body lets you know when it’s injured and unhealthy. Let’s get to it. How the nerves communicate with your body (3:25). A normal vs. abnormal nerve; this controls how you feel (7:25). History of nerve testing; the subluxation (11:15). Effects of pinched nerves (on exercise, diet, sleep, attitude); sympathetic/stress response (12:25). Learning to stay healthy (30:40). Patients’ review of this class helped them understand where their headaches, lack of sleep, back pain comes from. Now they know how chiropractic and their exercises/diet/attitude will get them and keep them healthy. This video gives you different ages that received a chiropractic adjustment on a Saturday morning. The viewer’s reaction to the adjustment has been popularized recently on YouTube and other video sites. The “viralness” caused by the emotional response to the adjustment is candid. As a chiropractor, I am always excited to be present at a person’s first adjustment. Patient’s laugh, cry, have a short moment of Terets; even scream in their native language. The second best is the reaction of other people watching the live adjustment; usually laughing, cover their mouth or mention a higher power. These reactions are real. I focus on the instant RESULT of the adjustment when I ask “How do you feel?”. Patient response: pain relief, looser, relaxed, headache gone, feel straighter. This is the purpose of the first adjustment, short term. But these good feelings usually don’t last. Long term Chiropractic care can fix their initial problem, so John or Jane can feel, and stay, better all the time. Who wouldn’t what that?